A week- long diving safari starting and ending in Sharm El Sheikh. This safari will take you DEEP NORTH of the Red Sea where still few and sometimes even no boats can be seen. The Marine Park safari is aimed to take you to Ras Abu Galum and Ras Mamlah, as well as Dahab area and with Tiran and Ras Mohamed world class sites are also visited! Magnificent drift, reef and wall diving, caves, plateaus and the blue. Dive into a virgin underwater world that is unique in both variety and the sheer number of species. 1. Day Afternoon/Evening: Transfer to New Marina (El Wataneya) port and embark. Welcome on board, cabin arrangement and boat-briefing. Permission work with port authority, sailing very early next morning. 2. - 7. Day	Morning: start at a nearby site for a check dive, then sail north. Near Nuweiba you will dive one of the highlights - the Ras Mamlah area, home to the most northern dive sites of the Abu Galum National Park. Amazing fan corals, table corals, soft corals followed by a steep wall. Barracudas and jacks pass by in the blue of the Gulf of Aqaba. You will also find more ravines, walls, caves, hills and chimneys. Ras Abu Galum is a sheltered bay where you will dive incredible wall dives from both the north and the south. Passing by Dahab you can visit famous sites like Bells, Blue Hole, Canyon, Eel Garden or the Islands. South of Dahab, within in the Nabq National Park, Gabr el Bint features a steep wall and colourful coral gardens. Two dives are possible here. These dives are among the most attractive in Sinai. Dive Gebel El Aswad, an underwater mountain only accessible by boat. It is possible to dive the wreck of the Million Hope and from there Tiran with its four famous reefs - Jackson, Woodhouse, Thomas and Gordon are not far. Back to Sharm and dive the world famous Shark and Jolanda Reef in Ras Mohamed National Park. 7/8. Day:	Depending on your check out and flight time return to New Marina (El Wataneya) port and disembark. Transfer to airport or hotel. You need to be at least a PADI Advanced Open Water certified diver or equivalent and have 30 logged dives. 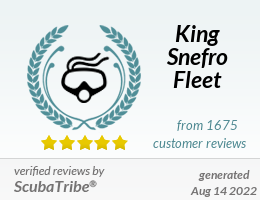 You must have dived in the last year and recorded this in your log book to join this safari, if needed Scuba Review is available onboard. This trip is suitable for snorkelers to join. The itinerary is an example so if you have a special wish for a certain place in this area just let your dive guide know. Liveaboard itineraries are subject to various unpredictable changes including weather conditions. All dives and especially some wreck dives are subject to divers experience and weather permitted. Liveaboard itineraries depend on the Egyptian Government, Coast Guard and/or Marine Police approval. Every effort is made but we cannot guarantee diving at specific sites. The final decision lies with the captain and guide. Safety always comes first!